Author(s): Fabiana Miraglia, Laura Betti, Department of Pharmacy, University of Pisa, Via Bonanno 6, P.O. Box: 56126, Pisa, Italy. Lionella Palego, Gino Giannaccini. Parkinson’s Disease (PD) and alpha synucleinopathies are multifactorial disorders, which manifest through motor symptoms and non-motor symptoms involving the Central Nervous System (CNS), the Peripheral Nervous System (PNS) and, recently, also the Enteric Nervous System (ENS). The typical hallmarks of alpha synucleinopathies are proteinaceous inclusions of alpha synuclein (αS). In PD they are known as Lewy Bodies (LBs) and Lewy Neurites (LNs), discovered in dopaminergic neurons of substantia nigra (pars compacta) as well as in other regions of the central and peripheral nervous systems. Despite the clear causes which lead to LBs/LNs are still unknown, according to Braak’s theory, these inclusions appear first in PNS to spread, following neuronal innervation, towards the CNS in a spatio- temporal dissemination described in a staging procedure. In line with these observations, several animal models have been used with the purpose to reproduce PD as well as to propose new therapeutic approaches. Different pathways can cooperate to neurodegeneration in PD such as genetic mutations of αS gene, mitochondrial dysfunctions, neuroinflammation. The present review highlights αS as the key-word for PD pathology and alpha synucleinopathies and a main target in PD research. Several therapeutic approaches can be proposed, however all of them are addressed in advanced stages of the pathology. Our focus will be the alteration of αS physiological pathway, which allows to address therapy in early stages at intracellular or extracellular level, such as the use of anti ER-stress compounds and innovative immunotherapy, which could be promising tools to reduce neuronal degeneration and to halt PD progression. Keywords: Alpha-Synuclein, animal models, braak’s theory, endoplasmic reticulum, immunotherapy, mitochondria, parkinson’s disease. Affiliation:Department of Pharmacy, University of Pisa, Via Bonanno 6, P.O. Box: 56126, Pisa, Italy. Keywords:Alpha-Synuclein, animal models, braak’s theory, endoplasmic reticulum, immunotherapy, mitochondria, parkinson’s disease. Abstract:Parkinson’s Disease (PD) and alpha synucleinopathies are multifactorial disorders, which manifest through motor symptoms and non-motor symptoms involving the Central Nervous System (CNS), the Peripheral Nervous System (PNS) and, recently, also the Enteric Nervous System (ENS). The typical hallmarks of alpha synucleinopathies are proteinaceous inclusions of alpha synuclein (αS). In PD they are known as Lewy Bodies (LBs) and Lewy Neurites (LNs), discovered in dopaminergic neurons of substantia nigra (pars compacta) as well as in other regions of the central and peripheral nervous systems. Despite the clear causes which lead to LBs/LNs are still unknown, according to Braak’s theory, these inclusions appear first in PNS to spread, following neuronal innervation, towards the CNS in a spatio- temporal dissemination described in a staging procedure. In line with these observations, several animal models have been used with the purpose to reproduce PD as well as to propose new therapeutic approaches. Different pathways can cooperate to neurodegeneration in PD such as genetic mutations of αS gene, mitochondrial dysfunctions, neuroinflammation. The present review highlights αS as the key-word for PD pathology and alpha synucleinopathies and a main target in PD research. Several therapeutic approaches can be proposed, however all of them are addressed in advanced stages of the pathology. 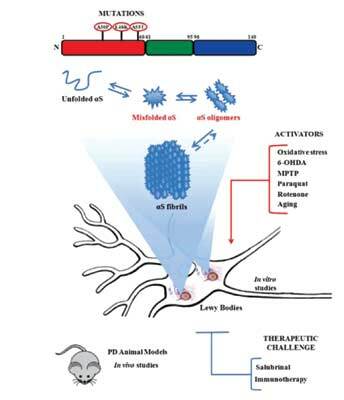 Our focus will be the alteration of αS physiological pathway, which allows to address therapy in early stages at intracellular or extracellular level, such as the use of anti ER-stress compounds and innovative immunotherapy, which could be promising tools to reduce neuronal degeneration and to halt PD progression.